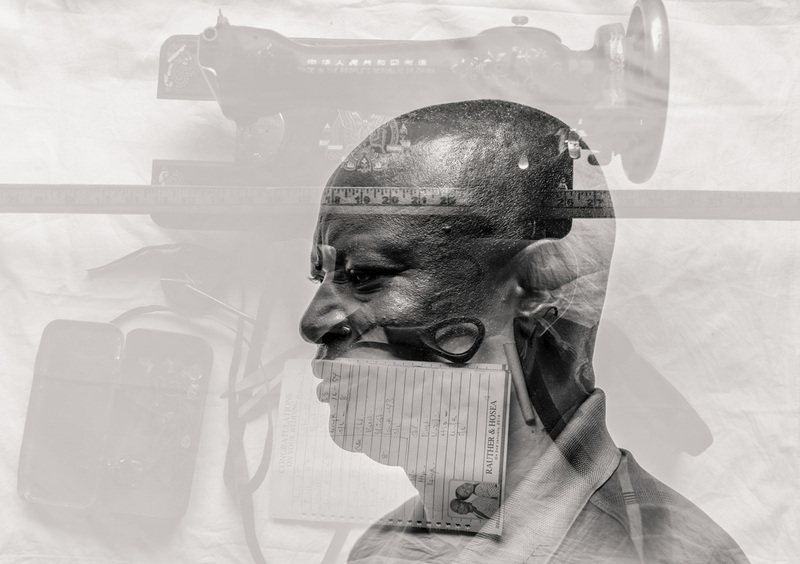 Nigerian Photographer Uses Double-Exposure Technique To Get Inside Her Subjects' Heads : Goats and Soda Etinosa Yvonne Osayimwen wants to show what's going on inside the heads of Nigerian survivors of violence. She layers their portraits with an image that reminds them of how their lives have changed. Abdul-Azeez Buba, 33, Borno, Nigeria: "Before Boko Haram attacked my community, I was a successful building engineer. I made a lot of money from constructing houses." Etinosa Yvonne Osayimwen's goal is to get inside her subjects' heads. The self-trained, 28-year-old documentary photographer does just that by using a double-exposure technique. 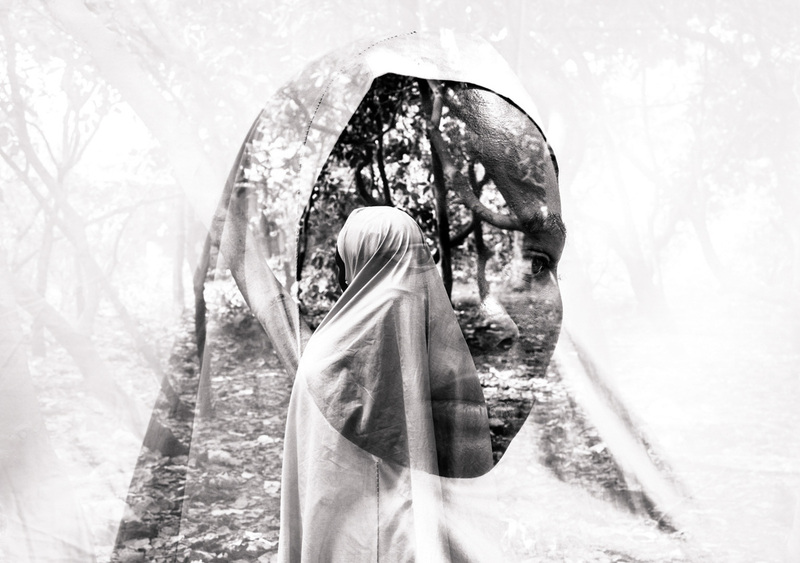 She takes portraits of Nigerian survivors of violence and terrorism — then superimposes it with an image of something that reminds them of how their lives have changed. 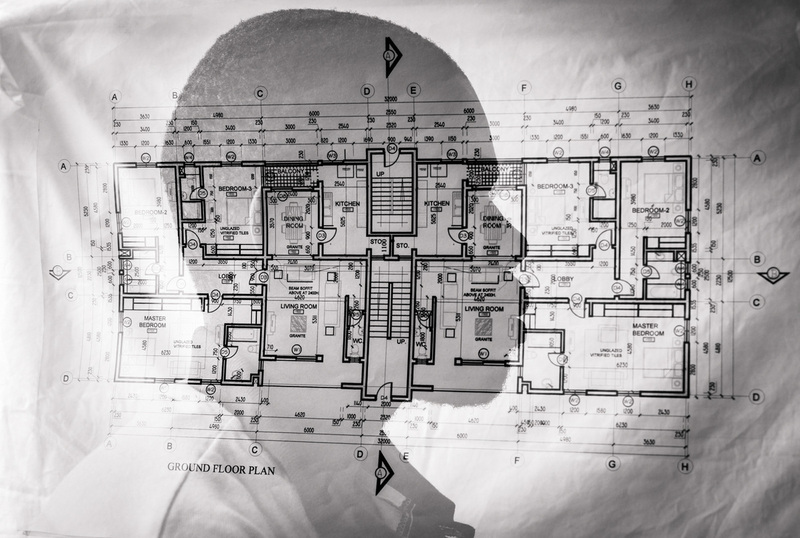 In one photo, for example, a construction plan is layered over the profile of a building engineer whose community was attacked by Boko Haram. 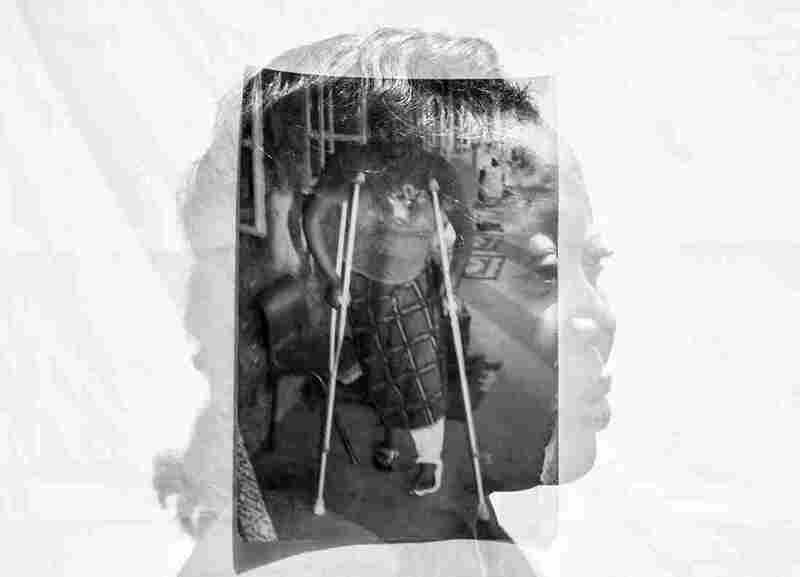 Another image shows a woman's profile covered in another photo of the same woman on crutches after she was shot in the leg. 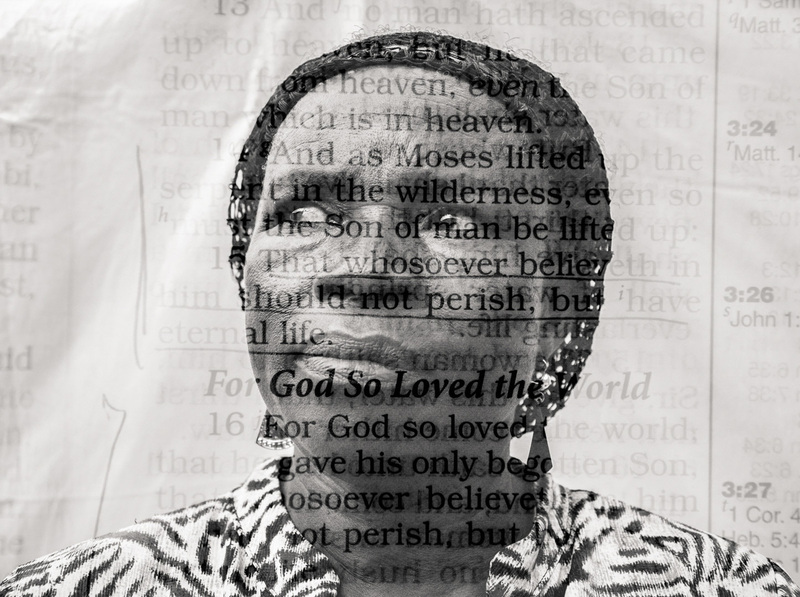 In July, the Nigerian was awarded a grant by Women Photograph to pursue her project, "It's All In My Head." The inspiration for the project came to her after seeing a documentary that included an interview with a young Syrian refugee who said he couldn't get out of his head the images of the violence he had seen. She says she wondered: "What goes on in the heads of the ... people in my country?" Violence, conflict and terrorism have plagued different parts of Nigeria over the last two decades, leaving thousands dead and more than a million displaced. Many of these were victims of the militant group Boko Haram. Others were caught in conflicts in Plateau State. During interviews with people in different parts of Nigeria, Osayimwen says she founds that "nobody really talks to them about how they are coping, what's going on in their heads, the events and memories that have been stuck in their heads. They are still suffering emotionally. It really is not easy to move on, even if it was 20 years ago." She says she hopes to bring attention to what she sees as a neglected issue. "I feel I owe these people a responsibility to tell their stories," she says. Some of the portrait subjects now live in displaced persons camps, but even those who continue to live in their native cities have had to learn to deal with new, more difficult circumstances. "They had successful businesses, they had houses, they were comfortable and all this was taken away from them," she says. Before photographing them, Osayimwen interviews her subjects. "I see that people are happy that someone is talking to them," she says. And when she shows them the final images, many have told her "this is exactly what is going on in my head." Saleh Adams, 45, Jos, Nigeria: "[In] 2001, my shop was looted. I lost all my sewing tools and equipment. Months later, I started over. Then [in] 2008, the shop got burnt. I made up my mind to stay idle, but my clients encouraged me to start again, so I did in 2014." 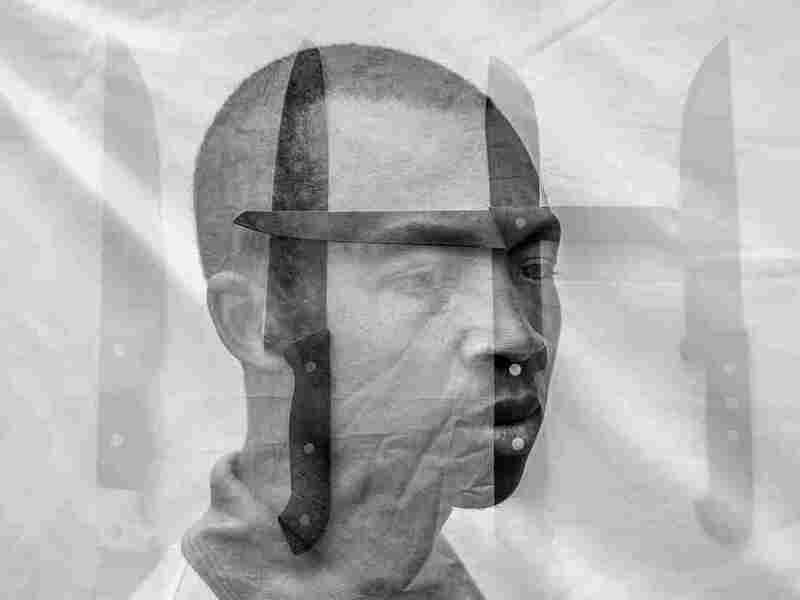 Julius Bature, 29, Jos, Nigeria: "Days before I was attacked, I heard that some members of the Sara-Suka cult were in town. As usual they were attacking people. A few days later, I was attacked by these boys. I was stabbed and left for dead. Thankfully I survived." Hajara Abubakar, 24, Borno, Nigeria: "When I wake up in the morning and just before I go to bed I think of all that happened. I went through hell, and I can't get it out of my head. Boko Haram is the worst thing that happened to me." Vou Choji, 36, Jos, Nigeria: "[In] 2001, I never imagined that I [would] be a victim at any point. [Then in] 2008, I was shot in the leg ... and I was hospitalized for three months." Rose Yusuf, 55, Jos, Nigeria: "I used to be the perfect definition of a Nigerian 'big woman.' Although I was a widow, I was doing very well for myself and my children. I had a very big shop were I sold food stuffs. Suddenly, in 2008, a crisis erupted and I lost all I had worked for over the years." The photographer supplied incorrect caption information for a photo that was originally labeled as Saratu Joshua. The woman pictured is Hajara Abubakar.